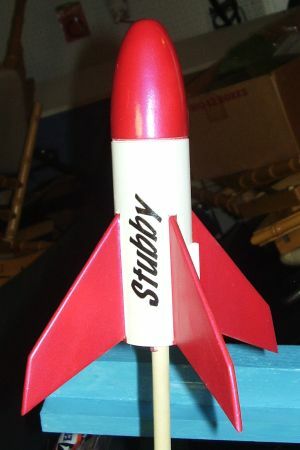 The Stubby is a simple but well thought out rocket for beginners. It's stubby appearance makes it distinctive from other "first rockets" and sets this 3FNC rocket apart from many others. It uses 13mm motors and recovers with a small mylar chute. The balsa sheet containing the fins was broken but the break was along the laser cut line. There was no damage to the fins themselves. They do seem a bit thick for a rocket this size but I like that. It also seems appropriate for a kit of this level where the modeler may be a bit rough from lack of experience or just plain clumsy like me. The body tube is a bit heavier than Estes quality. It was sturdy while being worked upon and seems like it will last a long while. The instructions consisted of 3 pages of 8.5" x 11" paper printed front and back. The illustrations were simple line drawing but were easily adequate. If I had one real issue, it was the nose cone. It looks like I probably got the last one before the cutting blades were sharpened. The texture was extremely rough and it will need plenty of filling. It was not quite bad enough for me to have made a major issue of it. Construction began with the building of the motor mount. This was fairly straightforward. A slot is cut into the motor tube and the engine retainer is inserted and held down with masking tape. The two plywood centering rings were then slid on to their marks and held with carpenter's glue. An engine block was inserted in the appropriate end, The Kevlarshock cord is tied to a ring which is then glued just forward of the forward centering ring. It's nice to see such a basic model including this method for mounting the shock cord. Marking of the body tube was done with a wraparound guide. ASP recommended that the body tube be roughed up a bit with medium or fine grit sandpaper to help the fins adhere better. I used 400 grit sandpaper because that is what I had sitting handy. After the body tube was roughed up and marked, the motor mount slid right in and was affixed with glue. The parts fit together well and probably did not need the light sanding I gave the rings in order to make them slide well. This assembly was then set aside to dry overnight. The instructions give the option of sanding airfoils into the fins or not. I almost elected not to do so since the laser cut edges would not look out of place on such a basic model, but then decided I would because part of my purpose in building this kit is to brush up on some of these skills. This is where the extra thick fin material came in handy. My method of rounding the edges involves running sandpaper over them like a shoe shine cloth. I am not as patient as I should be and I tend to snap at this point. As a result, the fins tend to snap as well. This time though, there was no trouble. The mounting of the fins posed no problem at all. This model marks the first time I have tried to use my Art Rose fin jig. That kept me honest on matters of alignment but this model is simple enough that it would have been easy anyway. The launch lug was glued on and it was time to work on the recovery system. This model is provided with a very long piece of Kevlar. Apparently it is intended to connect to the nose cone and the parachute. I like the Kevlar, but I also wanted something with some stretch for when the ejection charge goes off. I added a short length of sewing elastic and then put together the chute. As a rule, I despise the plastic garbage bag chutes. I like the Mylar ones only a little bit better. On most of my models I substitute a nylon chute for the provided one. In this case though I went with the provided Mylar chute. It was small, only about 7 inches across. The shrouds were precut and the attachment was by reinforcing rings. That is a definite step above the tape disks. The chute was easy enough to assemble and the model was ready for finishing. PROs: Instructions were logical and in order, easy to follow. Modern Kevlarshock cord instead of the rubber band. Sturdy materials. CONs: No elastic shock cord to use with the Kevlar. Finishing is my least favorite part of rocketry. I like nice looking rockets but I have the artistic aptitude of a turnip. I tend to go with whatever scheme is on the face card. In this case, the card shows a white rocket with red fins and nose cone. I changed this slightly to white with maroon trim. Gig ‘em Aggies! Before I got to the painting though, I used Elmer's Wood Filler on the fins and the nose cone. The fins came out fine with a single coat but the nose cone did not. The roughness meant that there was a great deal of filling and sanding so 4 treatments were needed. Painting was simple. I primed with white, added a few coats of gloss white, masked the NC and fins, and painted with a dark red. After the paint had dried, I applied the 2 provided decals. The decals themselves were very simple. The word, "Stubby" was printed in large, bold letters. A decal with some sort of distinctive logo for the rocket would have been nice but the ones provided are just fine. After the decals, I sprayed on some clear coat and the Stubby is ready to go. PROs: Simple design called for simple finish. The simple design looks fine. CONs: The nose cone was so rough that it was a trial to work with. I decided to go small for the first flight, but I didn't have a 1/2A3-2T so I used a 1/2A3-4T instead. That was a mistake. In fact, the entire 1/2A category should, perhaps be ruled out. The flight was spectacularly low and the delay was way too long. It tumbled to the ground and ejected about a second after impact. Fortunately, there was no damage. The second flight was on an A10-3T. It lifted right off the pad, went straight up, and ejected just after apogee. Recovery took place under the provided mylar chute and was just fine. This is a heavy rocket for a 13mm motor so I would stick with the full A motors from now on. PROs: Chute works well. Does not drift far. Kevlar provided. This is a simple rocket that goes together easily, is easy to finish, and flies well. It is big for a 13mm rocket, and that means there is less chance of it just disappearing.